THE LIVING: #Ferguson Embattled Cop GETS HITCHED! A Ferguson police officer, who shot an unarmed teen quietly got married to another police officer two months ago. 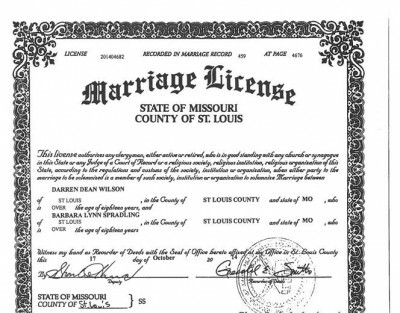 An uncovered marriage license shows, Darren Wilson, 28, got married to Barbara Spradling, 37, on Oct. 24, with one of his lawyers signing the license as a witness.